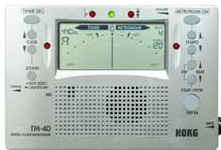 The Dr Beat metronomes are the most advanced models, having features not found in other metronome models.. These models are excellent teaching tools for learning simple or complex rhythms. All Dr Beat models are digital metronomes. The DB 88 is a talking metronome.. it will count out loud with a voice. The DB88 will also count very complex rhythms, with all parts of the beat being controllable. The DB60 has most of the same features as the DB 88, with out the voice and a few other features. All Dr. Beat metronomes come with a manual with full instructions.